“Relationship breakdowns are an all too sad feature of modern life – one in three marriages between 1995 and 2010 having ended in divorce. However, the impact spreads far beyond the couple involved, with damage and hurt being wreaked on immediate family and all manner of friendships. 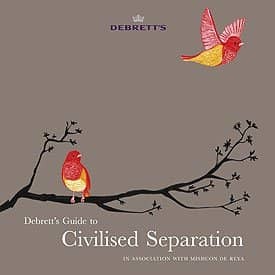 At Debrett’s we felt that, while there are many guides to the legal process of divorce, there is a paucity of advice when it comes to handling the personal issues associated with a major life trauma. We believe that courteous and considerate behaviour can acutally help to reduce unnecessary animosity and distress. After the Event: Everything you need to know about spreading the news, telling the children and cooperating with your ex-partner to dealing with the extended family and wider social circle. Available now: Amazon US , Amazon UK. If you read this book, tell us what you think of it by commenting this article !